A flow-through sample cell and ultra-clean valves provide in situ activation while maintaining high-quality vacuum levels. In situ preparation and activation deliver a fully automated method that does not require user intervention and fully integrates activation and analysis into one simple-to-use application. A high-precision mass flow controller, high-temperature furnace, quartz cell, heated exhaust port, and twelve gas inlets are all standard with this option. The design permits transition from a chemisorption arrangement to a micropore configuration within seconds. The 3Flex also includes enhanced software capabilities, data reduction features, and instrument monitoring. A new advanced dosing method allows the user to mix both pressure and volume increments. An innovative dashboard monitors and provides convenient access to real-time instrument performance indicators and maintenance scheduling information. Utilizing interactive click-and-drag calculation bars, innovative MicroActive for 3Flex software gives the user the ability to quickly fit a model to isotherm data, reducing the time required to obtain surface area, porosity, and chemisorption results. It is not necessary to generate reports to view results – see it graphically and interactively on the screen. User selectable data ranges through the graphic interface allow direct modeling for BET surface area, BJH pore volume, t-plot, Langmuir, DFT interpretation, and much more. The isotherm analysis suite provides an extensive selection of NLDFT models for calculating pore size distributions. 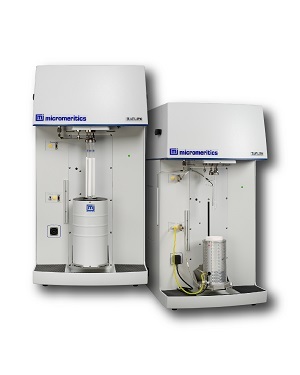 Chemisorption calculations include dispersion, metal surface area, and crystallite size. Unified Analysis Conditions for physical and chemical analyses allow users to rapidly develop new methods with a common interface.